How I make - Sauerkraut. I didn't know anyone who makes sauerkraut. After writing this page I discovered two people I work with have sauerkraut making mothers, both are Polish. It was fun to do this my way though. In primary school we were taught that sauerkraut was "pickled cabbage", its claim to fame was in preventing scurvy amongst sailors in long sailing voyages. Due to my ethnic background I've eaten sauerkraut as long as I can remember. Like most people I've mentioned this to I thought sauerkraut was (cooked?) cabbage that had been pickled using vinegar and salt - this is not true. 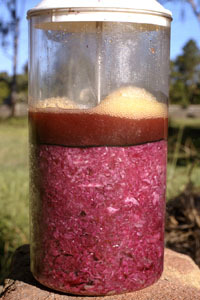 Sauerkraut is fermented raw cabbage - salt is usually used. What my mother told me. My mother grew up in the german occupied part of Czechoslovakia until the germans were expelled after WW2. As a child she helped make sauerkraut. Sauerkraut was one of the only vegetables they had to eat during the winter months. Making sauerkraut was a family/communal effort and made in large batches. Basically the method was to cut the cabbage leaf into small strips and cut up the core into small pieces. A layer of shredded cabbage a few centimeters thick was placed in a wooded barrel - sprinkled with salt and spices and then trodden by people in new wooden clogs. Layer upon layer was added this way till the barrel was full. A wooden disc was placed on top and weighed down. Thus cabbage was pushed down below the surface of its own juices - water is not added. After several days the cabbage would start to ferment and a froth would form on the surface. This was sometimes skimmed. The sauerkraut making process started at the beginning of winter and the cabbage was left in the cellar for a couple of months before it started to be used. They also preserved turnips in this manner. I've since been told how the Polish do it and it's almost identical with the exception that sometimes a small quantity of grated carrot is added. Playing with microbes can be very dangerous. If you accidentally culture the wrong bacteria it could be life threatening. In this page I'll tell you what I did, I'm not saying it's safe for you to copy me - that's for you to decide. Be extra careful making sauerkraut if you don't know what it's meant to smell and taste like. I think the traditional method should be fairly safe but when we try new methods we're in test pilot mode. You should seriously consider the risk of food poisoning. My interest in attempting to make sauerkraut stemmed from a related experiment. I had a lot of fresh chili growing and little immediate use for it. Having seen bottles of oil with chili inside I decided to stick some chili and garlic in (peanut) oil and see what happened. I was concerned the chili and garlic would rot but to my surprise it started to bubble after a few days. It's smelled ok. I was concerned about nasties like botulism so I started by consuming a few drops and after experiencing no ill effects - increased the consumption to normal levels (a few table spoons as stirfry oil). After that I got really game and fished a piece of garlic out of the bottom and ate it. I could taste a slight tang which resemble the tang in sauerkraut. My guess is the same agents (bacteria?) were involved. I quizzed mum for details and lacking a cart load of cabbage, a barrel, slaves and wooden clogs - I tried something more modest. I bought a small, strong container complete with a strainer arrangement at the top. It's called a coffee plunger (a polycarbonate one, six cup size). I cut cabbage into strips with a knife and placed a handful at a time in the polycarbonate container, added salt and caraway seeds - then crushed the cabbage with a wooden spoon. I filled slightly over half the container and used a teaspoon of salt. I had to scrounge the salt because I generally never use it. I plunged it till I had about 10mm of juice above the cabbage. It's starting to ferment, it's already starting to smell like sauerkraut so it's looking promising. The liquid level has risen and the froth is very clean looking. For some reason I was expecting it to be more dirty looking. I tasted some, sure tastes like sauerkraut but it's still crunchy. All the green color has gone now. A few vinegar flies have drown. Also the gas has pushed the excess juice out of the cabbage and the liquid level has risen. Mums folks may have left it 2 months but it seem pretty much ready after a week or so. I'd expect it would soften a bit with age but mine will be eaten before long. Mum even gave my sauerkraut the thumbs up. I made another batch. The same cabbage as before so it was a week older and drier. This one I made in a preserving jar - but I took the rubber seal off to prevent pressure building up inside it. I was lazy and didn't cut the cabbage as fine and I crushed it with a piece of wooden dowel (like a short piece of broomstick). I couldn't get as much juice this time. I didn't add any salt but I added some juice from the previous batch to flood the system with "good" microbes. There was also a small amount of chili and garlic from the oil which had been in the jar - again this should contain good microbes which is why I didn't wash it out. Anyhow in a matter of hours the liquid level started to rise and it fermented nicely. This sauerkraut tastes much the same as the salted one but mum reckoned it tasted sweeter - but it was still young. I'm not sure if the salt free cabbage would have worked without the sauerkraut juice to get it started. It's possible the salt is normally needed to kill bad microbes. It worked for me this time but I could have been lucky. I'm still here, I haven't poisoned myself yet. I've made a few more batches of sauerkraut since I last wrote - it seems the first one wasn't a fluke after all. I've tried a few variations - one was to use red cabbage. It worked but I really don't like to taste much when it's raw but I've been using it in cooking, I quite like it that way. Another batch had a fair bit of chili and garlic in it (no salt) plus some caraway seeds, juniper seeds and pepper corns. I've been cheating and using a food processor to shred the cabbage etc. The other change has been to use an "el-cheapo" fermentor. What I did is find some glass coffee jars that are fairly cylindrical and happen to be just the right diameter. Because they are the right diameter a stainless steel sink strainer is usually a tight fit and can be jammed into a bulge the jars have about 20 mm from the top. The jars were free and strainers are 80 cents each - which is a lot less than the cost of a coffee plunger. When I didn't have enough cabbage to fill the last jar I used a bottle of capers as a spacer to push the strainer down when the lid was screwed on. I put a small hole in each jar lid to allow the gas to escape. It would be nice to have more than a 20 mm gap at the top as the liquid tends to overflow. 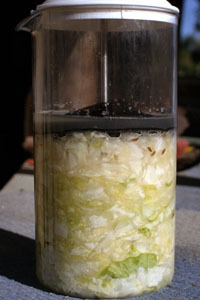 When the cabbage is fermenting the liquid is forced out of the cabbage raising the level substantially. When the fermentation stops due to low temperature or because it's finished - then the liquid is sucked back down. I think it's bad to have the cabbage exposed to air.